To provide direct in-school training in the use of computers as a teaching/learning medium for the teachers of 300 of the 385 schools participating in the Odysseia Programme. The remaining 85 schools are 69 small and remote schools and 16 primary schools that are covered by another training process under a pilot programme. To support teachers in the use of computer and network services in their endeavour to create active learning environments. To contribute to teachers' professional development and encourage their active participation in the training process. To institute continuous training in the workplace, supported by specially trained teacher/educators who, in addition to their teaching activity, also act as facilitators in the subsequent training of their colleagues. 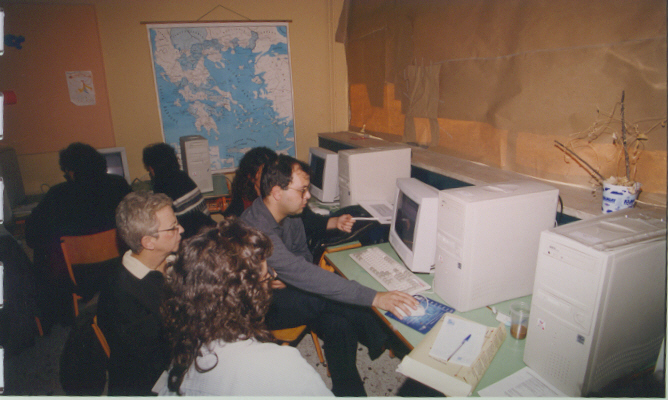 The Project trained the Odysseia teachers in the use of contemporary computer and network technologies to a degree that allowed them to use these tools in their lessons, whatever subject they teach. These teachers are now able to make direct use of computer and network technologies as supplementary teaching/learning tools. The whole process serves as a model for teachers throughout the country.